Place your order by December 15 if you’d like signed and sketched copies of Harley Quinn, Peanuts, TMNT, Totally Awesome, or The Zombie Gnome Defense Guide! Check the Couscous Collective Store for all your holiday shopping needs! Shaenon Garrity and I will be attending MileHiCon in Denver in two weeks! She’s there as a Guest of Honor, I’m there as a guest of a Guest of Honor. It’s our first joint signing of The Zombie Gnome Defense Guide! The weekend after that, we’ll be in San Francisco, at Borderlands, for more of the same. Protect yourself from Zombie Gnomes in style this Halloween. If you enjoyed Zombie Gnome: A Tiny Terror (and hey, who didn’t? 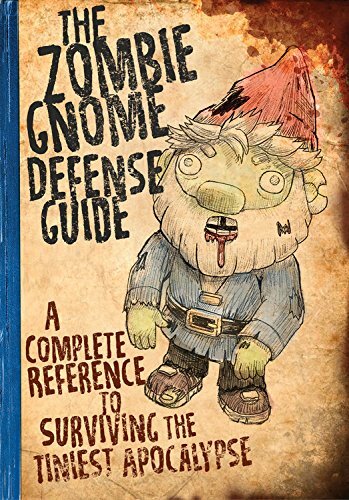 ), it’s time to visit your local bookstore and pre-order The Zombie Gnome Defense Guide, co-written by me and Shaenon K. Garrity! As the title says, it’s the complete reference to surviving the tiniest apocalypse. See you at San Diego Comic-Con International this July! I’ll be there promoting the Cartoon Art Museum and talking about my new and upcoming books! Franklin from the Peanuts comic strip turns fifty this year, and I got to weigh in on that anniversary in an article for The Bohemian: Black Lines Matter.